I just couldn’t let blueberry season go by without making some blueberry muffins! I wanted to try a healthier muffin recipe and a quick search turned up this recipe for blueberry oatmeal muffins . I liked the sound of using the rolled oats in the muffins along with whole wheat flour and a mashed banana and some vanilla yogurt for some extra moisture and flavour. Of course I could not resist replacing some of the sugar with maple syrup. Next, I just had to work in some pecans and I though that a pecan streusel would be a good idea. I had to make one unexpected additional change to the recipe as I was out of vegetable oil and I replaced it with an equal amount of butter. The blueberry muffins turned out great! I don’t even want to say how many I ate when they were fresh out of the oven. The muffins were super moist and had a really nice light and yet substantial texture and they full of flavour! The pecan streusel topping worked out surprisingly well. It stuck to the muffins and provided additional texture and flavour to every bite of muffiny goodness. These muffins are going to disappear way too quickly. Spoon some of the streusel onto the muffins. Bake in a preheated 375F/190C oven for about 20 minutes. Love the sound of these muffins. I cannot believe all the great flavors in them. Really nice looking steusel. The streusel on muffins look scrumptious. I have an award waiting for you at my blog. Kevin I love blueberry muffins. I like your twist in adding the maple syrup. A real treat. I like the picture with lot’s of butter. That’s a full breakfast right there. They look delicious! 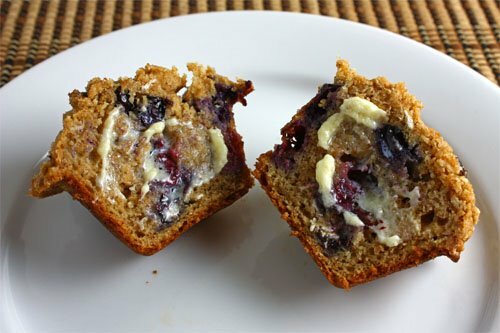 I just picked up 4 container of blueberries and thought to check to your blog – with all that bluberries recipe you have been making 🙂 This muffin looks so good!! Any blueberry muffins are great blueberry muffins! These look nice and moist. Another item in my list of muffins to make. These muffins look amazing! The streusel seals the deal for me! They would make a great grab & go healthy breakfast. These look great! I like the adjustments you made to make them healthier. Your blueberry muffins look delicious. I love the topping and the maple is a nice touch. Now here is a classic if I’ve ever seen one 🙂 The twist of banana sounds great, too! Lovely, lovely muffins. Blueberries and maple syrup are a great combination! ooooh! Guess what, I made blueberry muffins today too. That sort of makes us blueberry buddies. I need more blueberries before I can try yours because I already ate the rest. But I love streusel, it kind of puts candy on a muffin. Good job once again. Those look so yummy! I like the chunkiness of the streusal topping and all your healthy additions, espeically the blueberries. YUM!!!! I gotta print this one! looking yummy! i love streusel! These look seriously good. Your photos make me so hungry lol. Pecans are the best! Those muffins look magnificent! Well-risen and delicious! Great looking muffins Kevin! I’d love some for breakfast in the morning! i will love to bite into one of these. they look way too good! I’m envious! My Fav Breakfast combo! Oatmeal, Maply Syrup(or honey) and Pecans! Those look soo delicious! nice job! I am such a muffin fanatic and these look absolutely divine! 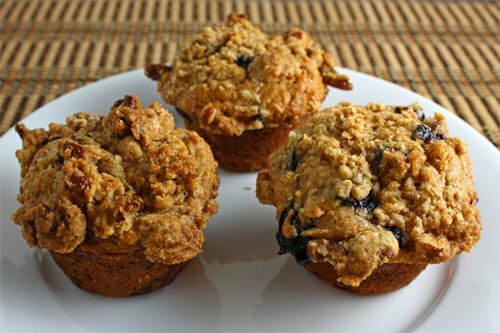 wonderful looking streusel and these really look like some solid muffins! I’m just saying…can I get an invite one of these days? I love how you incorporate the maple syrup with the blueberries and pecans. These look really yummy! I am a fan of blueberry muffins and your recipe takes them to the next level. Just a cup of coffee and I am all set. Thanks Kevin! Yum…my mouth is watering. I love the steusel topping. They look really tasty Kevin. I wish I could have one of these muffins for breakfast. They look so much better than my cold cereal! The pecan streusel looks delicious! A bit of streusel makes everything better. This is another “gotta try” recipe, awesome! If they had come fresh out of my oven they would have probably never even made it onto a plate for a photograph. Delicious. I have been looking for a new blueberry muffin recipe and this sounds perfect! Thank you for posting this. These muffins look wonderful. You have a geat blog with beautiful pictures. yum, I’m lovin these muffins!!! Great photo they look so delicious. Those sound so good that I’m not sure they would have lasted long enough for pictures if I made them! Oooh! I’m definitely going to have to try out that pecan streusel my friend. Your muffins are so much prettier than mine! This is a great recipe! I love the ingredients! kevin, these are too good! i love the crunchy texture and nutty flavor. these are next on my list! Stop! Stop! You’re killing me here. I am so long overdue to make bluberry muffins and these look astonishingly good. Ooo yes these look delicious! Especially with that pecan streusel on top. Yum! These sound amazing. Your photography is spot-on! These are some hearty looking muffins. They sound delicious…I love the pecan streusel topping. Yum! This is just the recipe I’m looking for today! I love the yogurt and banana additions. I’ll be making them soon. These were the best blueberry oatmeal muffins I’ve ever had. Sharing them with friends and neighbors has created lots-o-good karma. Thanks for posting. i just would like to know whenever you use oats for ur muffins, are they very dense and heavy and dry?i find that it soaks up all the moisture whenever i use oat in my muffins..
MT: These muffins came out nice and moist and light. All of the maple syrup, yogurt, banana, butter and blueberries did the trick. I started to make this not realizing that someone had eaten the last banana in the house, so I was forced to improvise. The significant modifications I made (or was forced to make) involved adding an extra egg, adding a bit of sour cream when I ran out of yogurt, using plain yogurt plus a dash of vanilla, substituting almonds for pecans and adding some lemon zest. I also layered the batter with individually placed (frozen) blueberries for a bit more control. The end result was delicious and the texture is basically the same as in your photo: light, fluffy and tasty with a nice sugary, nutty top. Thanks very much for the recipe! WOW! The inside looks fabulous! Just go to try this. The pecan streusel just made it look even more mouthwatering! This is L.O.V.E! Hey I just made these, and while they are great they came out a bit dry/dense. Any suggestions on what I could do to improve this? Cassangee: These should definitely have been nice and light and moist… Did you measure the flour sifted or packed? Did you use 0% MF yogurt? One way to make them lighter and moister would be to replace the whole wheat four with all-purpose flour but that kind of defeats the purpose. You could also add an extra 1/4 cup of yogurt or 2 tablespoons of butter or an extra banana. I love any sort of bread made with oatmeal and these delicious! Making these this weekend.